Viewing 3 of 3 items. Beautifully styled, this personalized Classic Glass Pitcher is perfect for water, lemonade, and sangria. 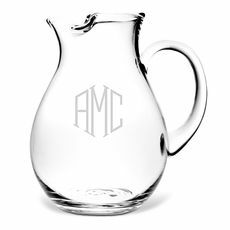 Each features a generous 90-ounce capacity and is individually hand-decorated with the monogram..
Our personalized pitchers are high quality and are the type of item you will be proud to use or give as a present. We offer personalization in various styles and the imprint will be perfectly etched into the glassware for a fabulous presentation. It's handy to have an extra pitcher in your home when entertaining either at your bar or simply for serving water at dinner. These are perfect gifts for housewarming, anniversaries, holidays and more. Personalized pitchers provide a fun and stylish way to serve guests. A personalized pitcher is durable and not only great for pouring mixed drinks but also fun for serving lemonade, beer, margaritas and more. A custom pitcher will be a great accompaniment to your other barware including wine glasses, high balls, double old-fashioned glasses and beer glasses.